THE third annual Henley House and Garden Show will be a celebration of all things green. Show director Niki SchÃ¤fer says next year’s event will focus on repurposed, upcycled and ecological items. 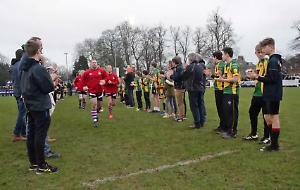 The show is also moving to the newly refurbished clubhouse at Henley Rugby Club, off Marlow Road, after two years in the town centre and will be held on just one day — Saturday, May 20. The first two shows were held over a weekend several weeks earlier in the year and featured trader stalls, workshops and talks which attracted thousands of people. Mrs SchÃ¤fer, an interior designer, who lives in Walton Avenue, Henley, said the 2017 show would be smaller after last year’s “brutally exhausting” event. “It’s not a sign of giving it up, it’s a sign of wanting to do things slightly differently and shake things up,” she said. “I want a new angle on it as I’m not very good at just repeating things. “It’s going to be the Henley House and Garden Show Green. The year after I might do something completely different. I don’t want people to come along and see the same old thing. I want to be able to give them new information and see things from a new angle and perspective. The “fashion” show that was held in the last two years will not be part of next year’s event but new features will include workshops with experts demonstrating skills such as thatching. There may also be an “ask the expert panel” where visitors can ask basic questions and seek advice on subjects such as planning or how to redo your garden or transform your home. The show will once again involve local businesses wanting to showcase themselves. Mrs SchÃ¤fer said: “We are looking for products and services dedicated to the house and garden, especially those with a ‘green’ slant. Local companies are the main focal point of the show and it will be another fantastic opportunity for them to meet with other local businesses as well as the fabulous, affluent and design- savvy Henley audience. “I’d like them to be able to show something that’s ecological, or green or sustainable, alongside their other products. “I have heard a lot of people talking about upcycling, recycling and repurposing and I was involved in repurposing the rugby clubhouse as the interior designer. “Rather than just pulling it down, we used the structure and made it look great again. “It’s a great venue — it’s large and accessible with good food and a café. We can also have an evening event with alcohol. From a repurposing point of view, it fits in with this green idea. It’s an example of what the show will be all about. Mrs SchÃ¤fer hopes that by holding the show later than previously, more gardeners will be able to exhibit their flowers and produce. She said it was currently still at the “embryonic” stage but promised it would feature “excellent craftsmanship and creativity”.